Three menacing vigilantes hurled bricks, nails and fencing at a man outside his home and one of them viciously attacked him with a baseball bat. He also hurled a broken bottle at him after trying to slash him with it, a court heard. The three troublemakers spray-painted “nonce” across a window at his boarded-up home after midnight before confronting him. Jonathan West, 26, of Redbourne Road, Grimsby, admitted assault, causing actual bodily harm, on November 10 and affray. 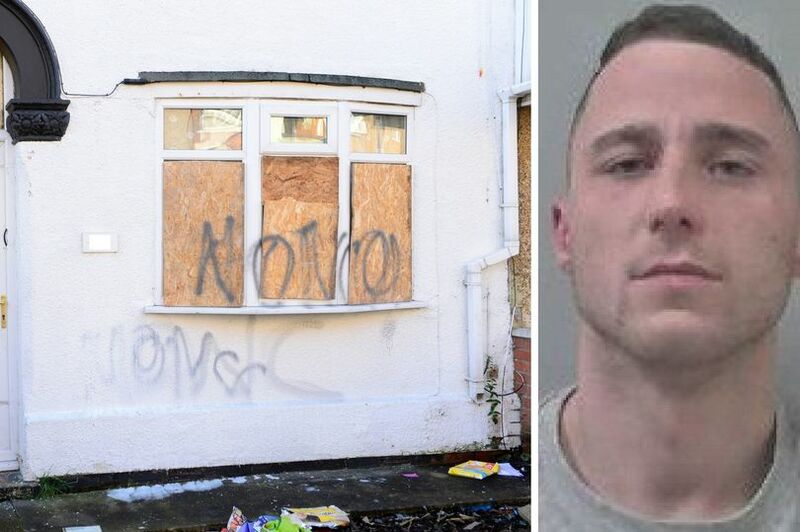 Jeremy Evans, prosecuting, told Grimsby Crown Court that West and two other males went to a man’s home and spray-painted the word “nonce” across a bay window and directly underneath on chipboard. The premises in Lincoln Boulevard, Grimsby, were boarded up after previous attacks. The occupier was watching TV in the rear kitchen area after midnight when he heard a noise and got dressed. West swung the bat towards the man, who put up his arm to block the blows but suffered bruises. “Police received several calls from members of the public aware of a disturbance going on,” said Mr Evans. The intruders — one of them wearing a motorcycle helmet — pulled nails from fence panels and threw whatever they had at the occupier. He was able to prise the baseball bat away from West, who picked up an already broken bottle and tried to slash out with it. He threw it and it hit the man, causing a skin wound. Masonry and bits of fence were thrown by all three. The occupier retreated back into his home and objects continued to be thrown. One of the males, not West, made threats to stab the man and took exception to the baseball bat being taken. There was a confrontation before the troublemakers retreated but West was arrested later in the morning. He had convictions for 59 previous offences dating back to 2002, including wounding, affray, burglary and breaching an antisocial behaviour order. Dale Brook, mitigating, said West had been in custody since November 11 and had no intention of approaching or contacting the victim. He was keen to receive help to stay out of trouble. There was a history between West and the man involved. West was jailed for 10 months but, because of his time in custody, was expected to be released shortly. He was given a five-year restraining order.